Not too long ago, it seemed like every smartwatch for sale had a rectangular screen. And while there's nothing wrong with this shape in and of itself, many consumers craved a more conventional design that didn't scream "tech geek." Well, the good news is that manufacturers from Pebble to Samsung have heard this and responded with new, circular-screen smartwatches that might even be mistaken for a regular wristwatch. Look out, Moto 360 — you're no longer the reigning champion of round-screen wearables! Motorola updated its well-received smartwatch this year, and the latest device retains the round display and Wear OS (formerly Android Wear) software and adds a variety of size options. The newer Moto 360 also boasts better battery life, but these improvements come at a higher cost; the smartwatch starts at $299, as opposed to its predecessor's $249. Just note that there's still a small black section at the bottom of the display that prevents the screen from being fully circular, in a technical sense at least. Plenty of people have complained about this aspect of the Moto 360's design, but Motorola has said it was a necessary trade-off in manufacturing this wearable. Finally, Pebble has a smartwatch that ditches the more casual rectangular screen shape. The $250 Pebble Time Round sports a circular color display that, like other Pebble smartwatches, is always on. This means you don't have to tap the screen to view notifications; just glance at your wrist and you'll see them. The Pebble Time Round might not satisfy the needs of all users, both because its display is low-power, without touch controls, and because the smartwatch doesn't run more advanced software like Wear OS, which features a Google Now app that displays relevant information from your various apps. With its timeline interface, the Pebble Time Round can still accomplish these things, but you'll need to press a button to navigate around. 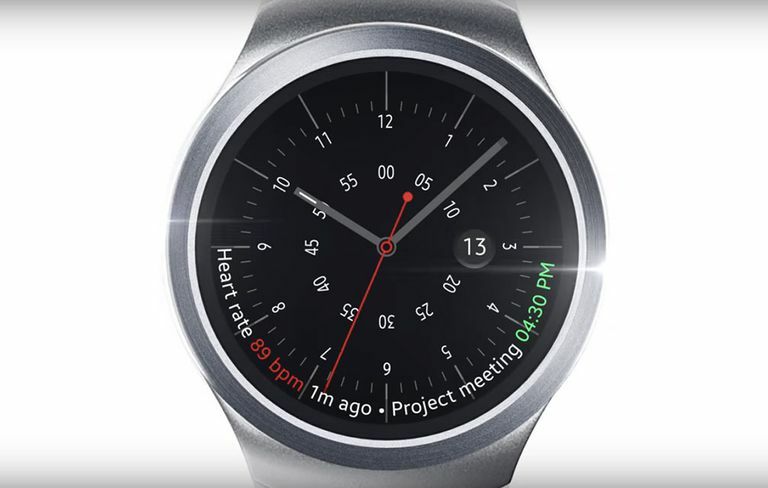 Another recent addition to the round smartwatch family, the Samsung Gear S2 is a polished-looking piece of hardware. It's not yet available, but we do know that it sports a touchscreen and includes NFC for making contactless payments. There are several models, which are differentiated both design (the Gear S2 Classic is the most sophisticated-looking) and by Bluetooth or 3G connectivity. Starting at $349 and going all the way up to $799, the Huawei Watch is the most expensive watch on this list, but it's arguably the classiest-looking as well. This wearable is one of the first Wear OS watches to offer iPhone support out of the box, and it includes a built-in heart-rate monitor to track your workouts. As far as design and hardware goes, you have several options. At $349, the least expensive is the stainless steel model with a black leather strap, while a stainless steel version with a stainless steel mesh band will set you back $399. For those who crave the ultra-luxe at a lower price point than the Apple Watch Edition, there's the $799 rose gold plated stainless steel model.